Bidisha Mohanty is a classical dance enthusiast with over 28 years of experience in Odissi Dance. She has been teaching the dance form for over 16 years in USA and India. Bidisha has to her credit several premier cultural events as a performer and choreographer. Bidisha is a gold medalist in the field of Odissi dance. Indraadhanush has Odissi, Folk dances, Semi-classical, and Bollywood dances. Her students are winners across prestigious dance competitions in Bay Area, CA. Her Odissi dance students are certified by the Akhil Bharatiya Gandharva Mahavidyalaya Mandal (abgmvm.org), India. She holds a Masters Degree in Odissi Dance and academically she holds a M.B.A. degree. INDRAADHANUSH is a premier institution which specializes in Indian Classical Dance-Odissi and Folk dances of India. The institute is being managed by Dr. Bidisha Mohanty. The sole motive of this institution is to popularize the ‘Deba Prasad Style’ of Odissi dance. 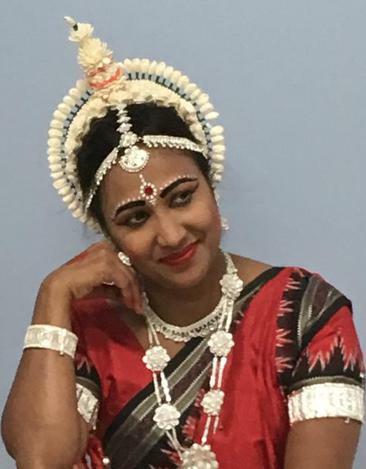 Bidisha also conducts workshops and lecture demonstrations for propagating Odissi and has been quite successful in inculcating a sense of commitment within its disciples. Bidisha offers the following programs. Her team has won various competitons (details below) and very recently her team won the Champions trophy at SHTC Talent contest. To take a photo tour, please click here or go to "Image Gallery...". Dr. Bidisha Mohanty has over 28 years of experience in the Odissi dance form. She has been imparting this dance along with Semi-classical and Folk Dances for over 13 years in India and various locations in USA i.e. New York, Illinois, Wisconsin and California. She has learnt this dance form under the able tutelage of Sri Durga Charan Ranbir, an Odissi maestro. Bidisha has participated in various premier cultural events as a performer and choreographer. As a performing artist in Doordarshan, India she has been the recipient of Scholarship from Centre for Cultural Resources & Training, Ministry of Tourism & Culture, India. ♦ Bhaskar (Masters) in Odissi dance from Pracheen Kala Kendra, Chandigarh, India. ♦ Dance Troupe won the 1st prize at the ICC Dance contest (2013). ♦ Dance Troupe won the 1st prize at the CCF Dance contest (2013). ♦ Dance Troupe won the 2nd prize at the ICC Dance contest (2012). ♦ Dance Troupe won the 2nd prize at the CCF Dance contest (2012). ♦ Dance Troupe won the 1st prize at the HSS 2011 (Bay Area) junior folk dance contest (May 2011). ♦ Dance Troupe won the 2nd Prize in Folk Dance at Naatya Raaga 2011. Photos and Winners List. ♦ Judged various dance competitions organized at cultural/ community centers in Bay Area (CA), New York, Chicago and Madison. ♦ Judged CCF-2010 dance competition at Hayward, CA.